The U.S. Consulate in Bordeaux permits building greater understanding and friendship between the people of the United States and the people of Aquitaine, Poitou-Charentes and Limousin. 1: The office provides limited consular services for American citizens only. All visa questions and applications must be referred to the U.S. Citizen Service in Paris. In case of emergency, please call Embassy Paris 0-810-26-46-26. 2: To explain American policy, society and culture. 3: To support American business (by helping them to enter French market, information to French companies looking for American goods and services) in a large range of fields: aeronautics, defense, electronic components, agriculture, food processing, wine, chemicals, pharmaceutical & biotechnology. 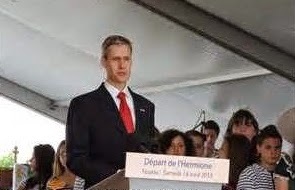 Thomas Wolf will speak about the lastest projects the consulate in working on and will be pleased to answer your questions about the French-American relations.